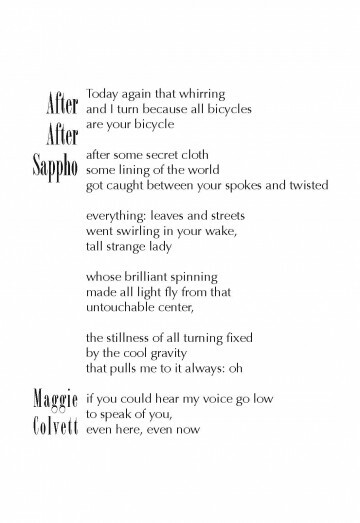 Maggie Colvett is an M.A. candidate at the University of Georgia. She served as 2014 editor of The Mockingbird, the arts and literature magazine of East Tennessee State University. A collection of her poems entitled The World by Memory and Conjecture was awarded ETSU’s Undergraduate Honors Thesis Prize in the Humanities for outstanding work in any area of the humanities. Her poems have appeared in Hayden’s Ferry Review, Cumberland River Review, and Still: The Journal. She lives in Athens, GA and Piney Flats, TN, where her family keeps many dozens of chickens. Sappho is ancient and mysterious – we have just fragments of her work – but she’s also very much alive because her concerns remain current. The typeface for the body of a poem that invokes her therefore had to be timeless but also a little mysterious. Optima provides a clean, modern silhouette but is it seriffed or sans? That depends on whom you ask. Bordeaux Roman provides a flourish to the ragged edge of a layout patterned after ripped notebook paper. The pair of lower case g’s in the poet’s name could be the wheels of a bicycle; those striking capital a’s could be the bicycle’s rider, spine leaning slightly forward on her long arms.